Doctor Who "Hide" recap: Why does Doctor Who love humans? Doctor Who “Hide” recap: Why does Doctor Who love humans? 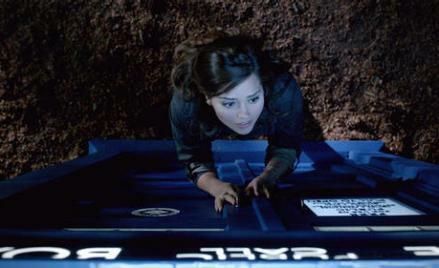 Is the mystery of Clara eating the character of Clara? In Slate’s Doctor Who TV Club, Mac Rogers discusses the Doctor’s travels via IM every week with the show’s bloggers and fans. This week he’s chatting about “Hide” with Phil Sandifer, who writes TARDIS Eruditorum. Mac: So in “Hide,” the Doctor and Clara arrive in 1974 at Caliburn House, a country manor that’s been the site of hauntings—even before it was built—by the “Caliburn ghast,” a spectral woman who always appears in the same beseeching position. There are already two investigators on site, a psychic named Emma Grayling (Jessica Raine), and Professor Alec Palmer (Dougray Scott), a former “spook” and war hero turned ghost-hunter. Was it odd or out of character that the normally nonviolent Doctor seemed so effusive about Palmer’s war heroism? Phil: Although, what is the Doctor if not a former spook and war hero turned ghost-hunter? Mac: Emma’s the one with the psychic powers, for sure, but Alec’s the one with all the substance, all the history. During the split-scene in which the Doctor talks to Alec and Clara talks to Emma, it’s a Bechdel nightmare: The Doctor and Alec talk about regret and moral reckoning and redemption … while Clara and Emma essentially talk about boys. Phil: Yeah. That was not the episode’s finest moment. Mac: I did love the Smith/Scott half, though. Smith portrayed the Doctor as riveted by this opportunity to listen to a man assessing his life in this way. It’s rare that we see the Doctor interact with someone he’s not educating or bantering with. Alec makes an interesting contrast to Kahler Jex from “A Town Called Mercy”—he may be deciding how his debt is paid, but at least he’s not hiding his debt. But I’m forgetting the ongoing Clara mystery arc! Phil: I’m not entirely sure about Clara in general, actually. I mean, I love Jenna Louise-Coleman, but I feel like the mystery of her character is kind of eating the actual character. Mac: Is Moffat overdetermining the companion’s character arcs, do you think? In Season 5, I felt like we got both the mystery of Amy and the character of Amy. Phil: But notably, the character came first. “The Eleventh Hour” is all about selling us the character of Amy, and then you get the barest hint of the mystery of Amy at the end. Here we got the mystery of Clara first, then the character. I’m not convinced it’s a problem. Is Generic Companion really so bad? Unless you really think that we still need the companion as our way in to Doctor Who—and most of the way through Series 7 of an enormously popular television show I think it’s a pretty tough sell that you do—I’m not sure a Generic Companion who serves as an interesting mystery isn’t perfectly fine. Mac: So we reaffirm, through Emma’s psychic powers, that Clara is an ordinary human. We have that now from both firsthand time travel observation and from psychic perception. Why give us the same non-clue a second time? Phil: I assumed Grayling was initially hiding something from the Doctor. That her “Isn’t that enough?” was “There’s more, but you don’t want to know it,” and that there was a revelation that the Doctor now knows that we don’t. Mac: Ooohhh. I didn’t pick up on that. Phil: I assume it’s going to tie back to River, since, well, that’s just basic Aristotle. One thing that’s interesting about Moffat’s mysteries is that he tends to be really ambivalent on the question of when the Doctor figures it out. It’s still not at all clear when the switch between RealAmy and FleshAmy in Season 6 happened, for instance. Which makes it very strange to play along at home, because the mystery cheats. But on the other hand, Moffat plays with a sort of scrupulous fairness: Part of why it’s so ambiguous when the Amy swap happens is that if you rewatch “The Impossible Astronaut,” it seems like the Doctor knows what’s up when he asks Amy if someone is “making her say this” when she tells him he has to go to 1969. So I think there’s an extent to which the mystery is designed to be speculation-proof. Clara is likely a mystery that is based around things that we can’t quite tell are clues yet. Mac: There’s no doubt the pace of Doctor Who has picked up noticeably in the Moffat era, which is very much in evidence in “Hide.” I like that this lets the show cover more ground, but other times I feel like we’re losing chances to just hang out with the characters, get to know them a bit more. Phil: The speed at which the premise gets set up is just breathtaking. You get a minute or two of generic ghost hunters story, drop the Doctor in, and you’re off to the races. I kind of like the accelerated pace, in part because it just feels very fresh and interesting in the face of the American cable tendency toward slowness. Doctor Who is very actively going in the opposite direction—hyper-compressed storytelling. Mac: There’s almost a sense of writer Neil Cross and director Jamie Payne hurrying us through the obligatory haunted house exploration bits so they can get to the sci-fi explanation. Phil: Well, if only because the sci-fi explanation lets you get to those gorgeous wooded sections. Which, wow. And that’s quite clever too—switching from haunted house to Hound of the Baskervilles midway, which doesn’t change the tone of the story but just makes the whole thing feel even bigger and more of a roller coaster. Plus, again, just stunning visuals. Mac: No doubt, those scenes looked amazing! Moffat’s definitely overseen a quantum leap in the show’s visual texture. Phil: And I love the very late reveal of the monster. I mean, the confidence the series has in its visuals these days is just mind-blowing to anyone who watched the classic series. It goes an entire episode acting like they didn’t have the budget for a proper monster and were just going to get by with some CGI wooshes, and then they reveal an absolutely gorgeous design just for that moment of the Doctor being in “I’m reuniting lovers!” mode and then coming face to face with this thing. Mac: I loved how it moved, how utterly inhuman (and non–Deep Space Nine-y) it was! Phil: One thing I loved about “Hide” was that it didn’t quite have an ending. It feels like it wraps up at about 35-40 minutes, then suddenly acquires a whole new plot thread when the monsters are lovers, then leaves that off before quite resolving it. Mac: It ties in to what you’ve been writing about how television has learned to let us fill in the gaps. We don’t see the Doctor, Clara, and Emma save the creature at the end, but we’ve seen them pull it off once before so we don’t need to see the whole process a second time—we “auto-fill” in our minds. The accelerated pace also made room for that quieter moment between the Doctor and Clara at the midpoint. After watching the Doctor pilot the TARDIS through “the entire life cycle of Earth’s history,” Clara says, “We’re all ghosts to you. We must be nothing. What can we possibly be?” The Doctor’s response is gonna have some Doctor Who fans baffled and some others angry: “You are the only mystery worth solving.” That’s one hell of a thing to have the Doctor—an intergalactic time traveler—say, right? We might think he just means Clara, but that’s not what she asked him. She asked, “What can we possibly be?” meaning, as I take it, humans. But isn’t that belied by the episode ending with him solving a mystery involving very non-humans? Phil: I think the Doctor is clearly answering a slightly different question than Clara asked there. But I also think it’s true for the Doctor—it’s why despite being an intergalactic time traveler and quasi-god, he really loves late-20th/early-21st-century Britain more than anything else in the universe. This “humanity” thing keeps drawing him back in. Mac: It seems this quasi-god has a real fascination for how much mayfly-like mortals can pack into their short lives. Phil: One does get the sense that the Doctor does just like “people.” Whatever their species. And that he’s not all that invested in the differences. It fits with my overall view of Moffat’s work, which is that it’s about clever but fundamentally aloof people learning to exist in society with friends and family. And it’s the fundamental difference between Moffat and Russell T. Davies. Davies wrote the Doctor as a humanity fan: “I think you look like giants.” Moffat writes him as someone constantly grappling with a desire for humanity. Mac: Great example: When Clara’s upset in the TARDIS, it clearly wigs the Doctor out. He doesn’t know how to just step back and let the other person speak. He keeps prodding her: “Some help? Context? Cheat sheet? Something?” That’s some grappling with a desire for humanity right there. Phil: And in that regard, Moffat’s hyper-compressed storytelling fits what he’s doing. If Doctor Who is going to be about a very strange man trying to understand us, its structure needs to be a bit strange and off-putting. But it’s a new approach to television, and it’s no surprise that Doctor Who sometimes flubs it. When it doesn’t work you get “Power of Three,” where this auto-fill tactic results in a very clumsy ending. When it does you get “Hide.” That’s the price of experimenting. Mac: Was Clara’s line, “When are we going?” a tip of the hat to Inspector Spacetime? Mac: Yeah, don’t they have a classic series consultant on set at all times? And if not, where can one apply for that position?